Cray Wanderers extended their lead at the top of the table to sixteen points thanks to a devastating eleven minute spell just before half time and a comfortable and controlled performance for the remainder of the game over a spirited and hard working Guernsey side. With the blustery and wet conditions it took a while for either side to settle into the match, but Cray did most of the early attacking down either wing with Joe Taylor and Junior Dadson going close. The Green Lions best chance came to Frank Tobin who headed over from a corner, but from there The Wands had the better of things again. Jerome Frederico had a shot saved by Callum Stanton at the near post and then Tobin made a superb block to deny Frederico after he combined with Karl Dent. The visitors defence was finally breached on 31 minutes when Jay Leader set up Dadson who crashed the ball into the top corner from 20 yards out. Dave Rihoy had a good chance to equalise for Guernsey soon after, but his well driven low shot from distance was tipped away by Nick Blue. Almost immediately Cray made it 2-0 when Frederico and Dent combined from a short corner to send in a low cross that Taylor flicked home from close range in a crowded six yard box. Dent had a powerful effort saved by Stanton and Taylor saw a headed goal ruled out for offside before Bradley Pritchard made it 3-0 on 42 minutes when he controlled a great pass from Dent and coolly placed his shot past Stanton to the corner if the net to make it 3-0 from ten yards out. Just before half time Mitchel Nelson was booked for The Wands when he pulled back Carlos Canha who look set to break through on goal in the centre circle. The second half didn’t ever really reached the heights of the first period, Cray lost Ben Mundele to injury and Dadson slotted in at right back, while Wands keeper Blue was clearly struggling with a leg injury that saw him struggle to move freely at all. 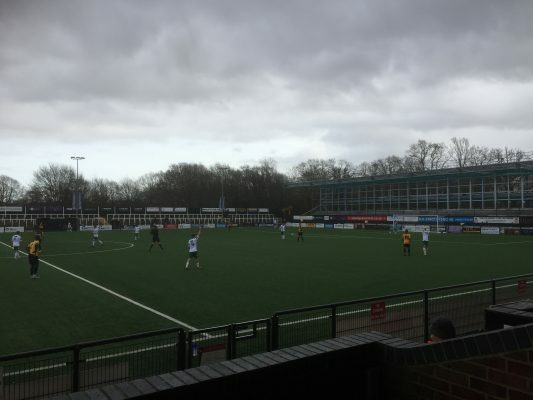 As the weather settled down both side s got the ball down and played a bit more, Frederico put a ball across the area which Taylor just failed to connect with and Taylor had a shot saved after good work by Daniel Uchechi, but chances were few and far between. Late on Canha had a shot bravely saved by Blue, but the biggest blow that came to the leaders was when Tom Phipp was red carded for an off the ball incident, that no one apart from Referee Dempster seemed to see. Tony Russell’s impressive Cray side travel to Ramsgate next Saturday as they look to keep this excellent run going and achieve the ultimate goal come the end of April. Cray: Blue, Johnson, Leader, Nelson (Evans 86), Mundele (Roberts 50), Dadson, Dent (Uchechi 64), Pricthard , Phipp, Frederico, Taylor. Subs Not Used: Fujimade, Parker. Guernsey: Stanton, De Le Mare (Marsh 70), J Dodds, T Dodds, Tobin, Manon, Rihoy (Fazackerley 52), Skillen, Pereira (Dyer 75), Canha, Loaring. Subs Not Used: Jackson. Goals; Cray – Dadson 31mins, Taylor 36mins, Pritchard 42mins. 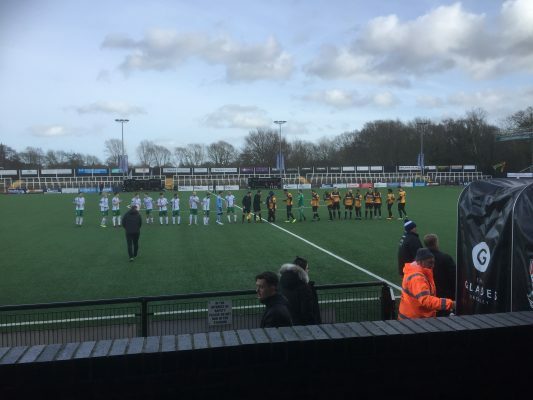 This entry was posted	on Saturday, February 9th, 2019 at 4:50 pm	and is filed under Football, Non-League Football. You can follow any responses to this entry through the RSS 2.0 feed. Both comments and pings are currently closed.